Eek! It has been AGES since I had to “study” for a test! The last one was surely my UK driving test 10+ years back. 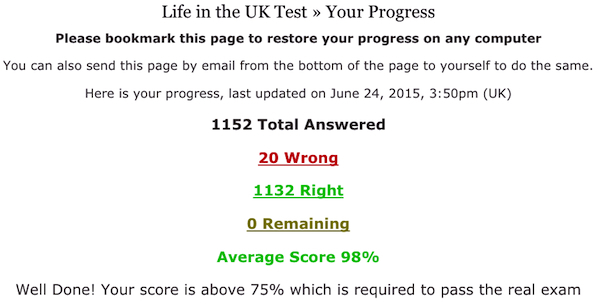 I can only hope the Life in the UK test goes as well. The driving test took me about 7 minutes to complete and I got a single question wrong – but then, that didn’t require me to remember DATES. I’ve been known to forget the year the kids were born, for heaven’s sake. How am I meant to remember that there was a huge influx of Jews to the UK in 1656? or that after 1695 newspapers needed no government license? Those questions did come up in the practice tests. I have done so many practice tests my head spins. Based on that I should feel more confident but I don’t. I’m not a great test-taker, never have been. Doing the three days of tests for my Master’s degree had me in knots, despite having gotten straight A’s thru the entire program. My tummy churns, my head throbs, and I second guess myself on every question. by 4:30 pm I’ll know. I’ll add these for balance. We’ve lived in the UK for over 20 years, with a short break back in the States after DD was born. I love living in the UK, but that doesn’t make me any less American. And dual-citizenship won’t either. 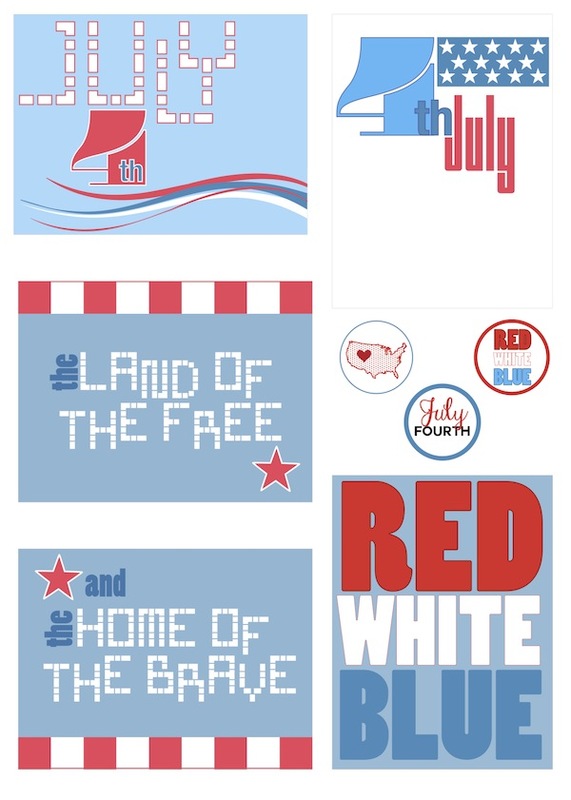 So here are some 4th of July printables to download. I think they are a bit fun and colourful. I sort of designed the two quotes from the Star Spangled Banner to be used together, either side-by-side or one each on two side-by-side pages, but that was just my thought. The vertical 4th card could be used for a bit of journaling or even a small photo. I added a trio of little circles to punch as well. Hope you find them useful and as usual, I would love to see how you use them! Categories: musings, printables, Project Life | Tags: printables, Project Life | Permalink. PS yep, the test was actually so easy a DAY of study would have probably been enough had I gotten THAT random test 🙂 Spoke to a guy in the waiting room who said the last time he did one it was ALL dates and out of 7 people NO ONE passed. DS and I lucked out. He even had a questions about the Boston Tea Party LOL! Good luck on the test! I know you will pass with flying colors!! !